A form I-130 is a document that helps relatives of a citizen or a permanent resident of the U.S. immigrate to the United States. The form is intended for establishing relationship of a person to his/her immigrating relatives. The form is called a Petition for an Alien Relative. Only eligible alien relatives have the right to apply for permanent residence in the U.S. Prior to preparing a form aliens have to pay the correct filing fee. After fee is paid, start to fill out a form. It is vital to file a separate application form for each alien relative. On our site you can find up-to-date blank I-130 form sample that can be easily prepared online or downloaded on a computer. In order to prepare a document properly, a person has to follow strictly the specified instructions. An applicant has to fill out a blank form correctly and include all required information. The form is divided into several parts. In order to be accepted and processed, you have to fill in all mandatory fields in a document. Otherwise a document will be rejected. When preparing a form, a petitioner is required to provide information regarding relationship and provide his/her personal details. It is also required to provide personal relative`s details as well as details about a place where he/she is going to live in the U.S. and his/her address abroad. After all requested data is inserted, check if it is complete and true and submit to a recipient. Further a document will be considered and verified by the USCIS officer. 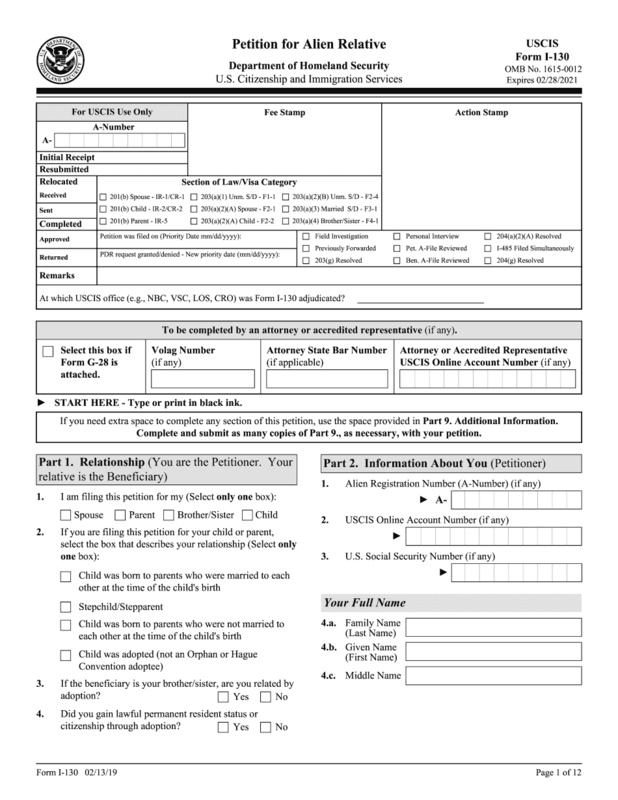 It is vital to sign a form, otherwise it will be returned by USCIS for correction.